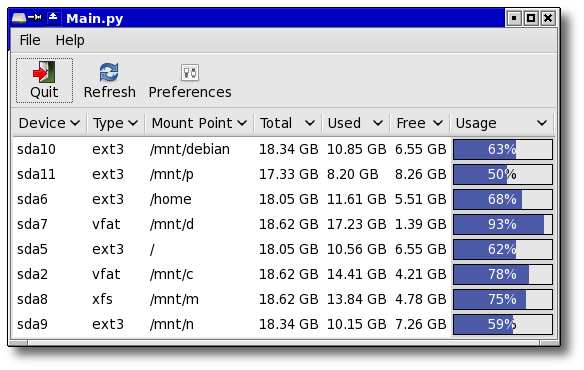 Frees is a GUI tool that shows the HardDisk space usage. It is written in Python using the GTK2 framework. This will only work in linux as it depends on the 'df' command. Frees just parses the output of df and shows it in a graphical format. Frees features a very simple interface. 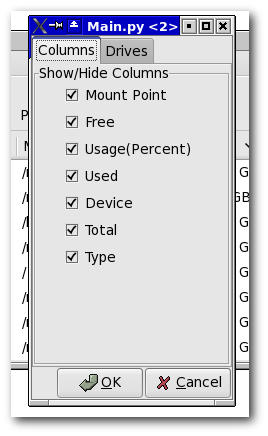 Granted, some of the columns like Device, Type and Mount Point may sound a bit geeky - but hey, you are using Linux. Its supposed to be geeky. There may be some drives that you want to hide in the list. Like, say you have a 10 mb '/boot' partition - you have no user-level use for that. Then you can hide that partition in the list. Go to Preferences > Drives and check off the drive you want to hide. The last item in the list is the 'Total' row. It shows the total space of your harddisk. Note that this shows the total of all mounted drives - so it may not be an accurate measure of your total HDD space. My favorite license is BSD License - but I am using GPL V3 for this one as an inside joke.